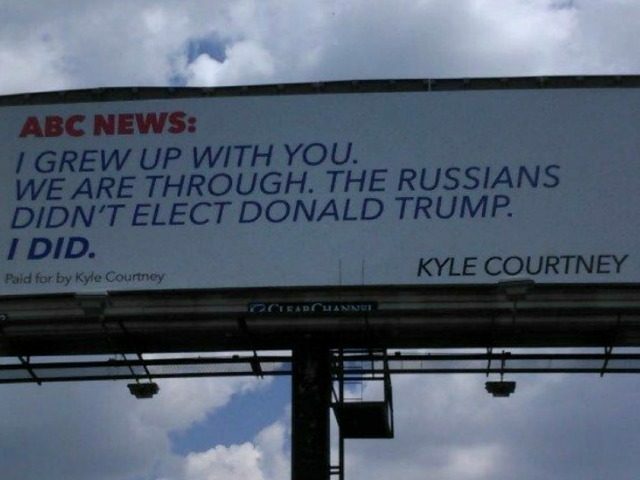 A Donald Trump supporter in Texas has paid for a billboard attacking ABC News for its coverage of alleged Russian interference in the 2016 presidential election. “I grew up with you. We are through. The Russians didn’t elect Donald Trump. I did,” the billboard reads. ABC News was the only channel I watched as a child growing up in Texas but I think they have lost touch with America and forgotten the working man. They don’t represent our voice anymore. Hillary Clinton’s presidential campaign was funded by the Clinton Foundation in close coordination with the media, and now we’re seeing them try to fix what they couldn’t fix during the election. They are doing everything they can, night after night, to create narratives and sway people’s direction to impeach Donald Trump. Our democracy is at stake when a major political party and the media are in bed together. I’m not asking anyone to boycott the Democratic party. I’m not in the brainwashing business, but the liberal media is. According to News4, the billboard, which was put up on Tuesday, will remain up for around two months and may be accompanied by a follow-up message when its lease ends. A study conducted by the Media Research Center (MRC) found that the evening newscasts on the “Big Three” TV networks, ABC, CBS, and NBC, were overwhelmingly hostile to Donald Trump. Meanwhile, Trump has accused ABC of propagating “fake news” over their coverage of his alleged ties to Russia.